Ein trockener Qualitätsrotwein aus Ribera Del Duero, Castilla Leon, Spanien. Alkoholgehalt: 14%, Rebsorte: 100% Tempranillo, Flascheninhalt: 0,75l, ausgezeichnet mit 94 Parker Punkten (siehe unter Informationen). 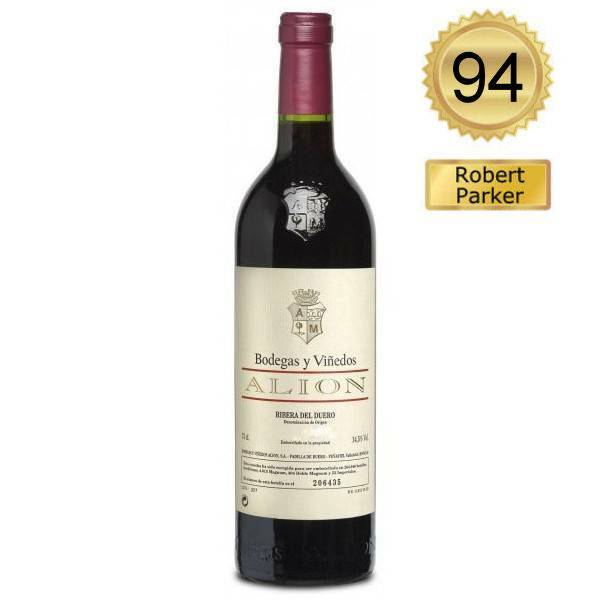 The 2011 Alion is pure Tempranillo from vineyards averaging 25 to 30 years of age, harvested early (second half of September) matured for 16 months in new Nevers barrels (that’s a difference with Vega Sicilia; for Alion all wood is French). It is an exuberant, ripe Alion, with hedonist’s aromas that jump out of the glass. Winemaker Javier Ausas tells me he likes the wines when they are young and showy like this one. It is indeed a showy vintage, with aromas of violets, molasses, cereals and a whiff of malt whisky. We tasted the wine a little warm, but that does not benefit the wine, which should be served at 15-16 C and allowed to warm up and open up in the glass. It’s also quite smoky, with reminiscences of very good barrels, black aromas, violets, black olives and fresh plums. The palate is tannic with lactic and warm flavors. This is a very exuberant, showy vintage for Alion, and here I tend to agree with Ausas: even though this has plenty of stuffing to age I’d drink it young in its exuberant phase. 290,000 bottles produced. Drink now-2019. The big news here is that the 2010 Alion will not be released because there was a problem with the fining leaving suspended sediment that was floating in the wine, which made it cloudy. They decided not to release it. That means more than 300,000 bottles of wine will be destroyed, a hard decision to make, but as they are committed to offer only the very best quality to their customers, they decided to release 2011 earlier than normal and skip 2010 altogether. That’s a brave decision, which implies a substantial cost to the winery to preserve the quality of the wines. I also tasted the 2009, which I had not tasted before.